The people of Rojava are engaged in one of the most liberatory social projects of our time. What began as an experiment in the wake of the collapse of Assad’s forces in northern Syria has become a stateless federation of autonomous councils and collectives. What began as a struggle for national liberation has resulted in strong militias and defense forces, the members of which participate fully in the unique social and political life of their region. What started as a fight for the Kurdish people has resulted in a regional home for Kurds, Arabs, Syrians, Arameans, Turks, Armenians, Yezidis, Chechens, and other groups. What began as the hierarchical Marxist-Leninist political party, the PKK, has evolved into what its leader Abdullah Öcalan calls “Democratic Confederalism,” which is a “system of a people without a State,” inspired by the work of Murray Bookchin. What we see in Rojava today is anarchism in practice. Map of N. Syria as of September 5, 2016. The yellow shaded regions represent area controlled by the Syrian Democratic Forces, a coalition of militias that includes the YPG and YPJ. The three cantons of Rojava include Efrîn in the top left, Kobanî just east of the Euphrates River, and Cizîrê in the top right. Each Canton subscribes to a constitution that affirms a society free from authoritarianism and centralism, while allowing for pragmatic autonomy and pluralism. Councils are formed at the street, city, and regional levels. While each council functions differently depending on local particularities, a few key similarities can be found throughout. Committees are self-organized, the councils mediate conflict on an individualized level, cooperatives strive for economic independence through local production. The explicit intention of the Cantons is to remain decentralized and stateless — and to extend this practice beyond state borders where nascent councils have already usurped the state in dealing with day-to-day affairs. We, in Rojava Solidarity NYC, express unwavering solidarity with the people of Rojava, the anarchist nature of this project, and with the revolutionary intentions behind it. Now the people of Rojava and the extraordinary social project they have established find themselves under the threat of violent extermination and repression. The reactionary forces of the Islamic State of the Levant (ISIL) are attacking on multiple fronts, engaging the People’s Protection Units, regional militias, local people, and anarchist support units in the fight for their lives and the free territory they have built. Turkey’s president Recep Tayyip Erdogan, afraid of the Kurdish independence project, is squeezing the region from the north, blocking support and supplies and now helping ISIL attack Rojava. Rojava Solidarity NYC has been formed to support the Cantons of Rojava in this dire time of need, to publicize this inspiring social project and the struggle it is engaged in, and to provide a forum where we can learn from the pragmatic anarchism in this region. We call on those in the revolutionary left of New York City and beyond to do the same and to support the autonomous territory of Rojava. 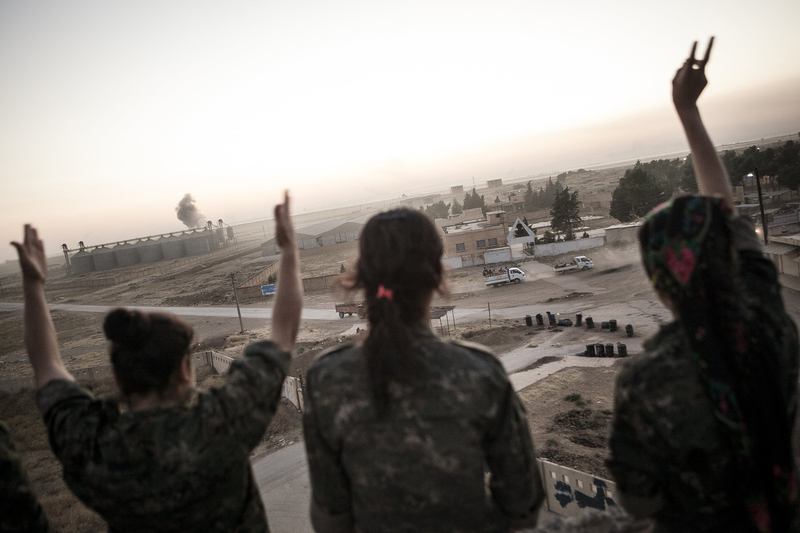 An essay-length introduction to the autonomous cantons of Rojava. A collection of essays, interviews, and reports covering the Rojava Revolution, from Strangers In A Tangled Wilderness.